Note: This article applies only to Office 365 operated by 21Vianet. 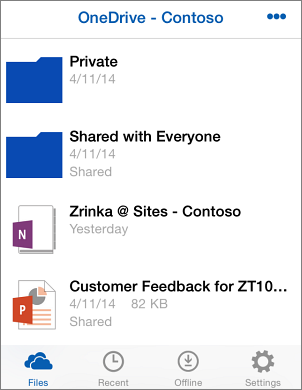 If you don't have OneDrive installed, download it from theApp Store. You now have access to all the files you saved in OneDrive. 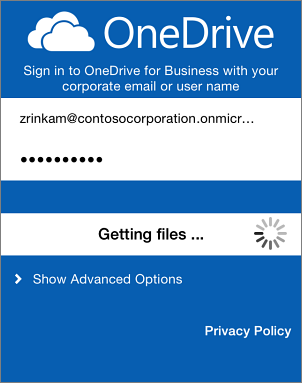 On the Sign In page, type your Microsoft account, for example <someone>@outlook.com to access your personal OneDrive files, or add your work or school email, for example tony@contoso.com to access the OneDrive files associated with that account, and then tap Next. Open the app on your device, and then tap Menu. If you already added a Microsoft account and you don't see the option to add another account, on the account screen tap Settings and do the following. Add the email address for your Microsoft account to access your personal OneDrive files, or your work or school account to access the OneDrive files associated with that account, and then tap Sign in. To switch between accounts, tap Menu, and then tap the account you want to view documents from. Open files Tap any document to open it. You can only view documents using the OneDrive app. If you want to edit a Word, Excel, PowerPoint, or OneNote file from your iPhone or iPad, you need to install and set up Office on your device. See Install and set up Office on an iPhone or iPad for more information. Share files Tap the file you want to share. When the file opens, tap Share . Get more help Tap Settings > Online help.